As blogged on 3ders.org, the construction industry is one of the greatest contributors of greenhouse gasses as one-third of global emissions are attributable to the building sector. A large chunk of those GHG are embodied in the concrete used for flooring systems, so there are various ongoing efforts to reduce the usage of concrete throughout buildings. The key to using less material without sacrificing strength is geometry. An arch is a great example: weight pressed onto the top of the arch gets distributed throughout the whole shape because it resolves forces into compressive stresses while eliminating tensile stresses. 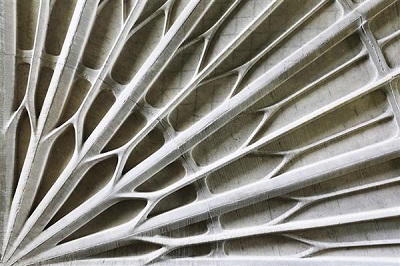 A team of researchers from Block Research Group, the Institute of technology in Architecture, and ETH Zurich has used 3D printing to apply that same principle to concrete floors.